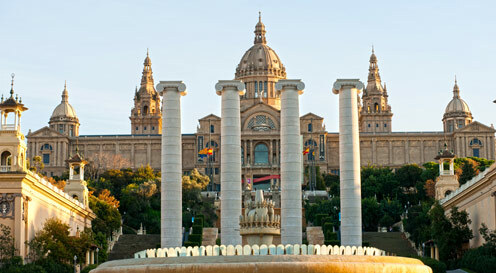 The National Art Museum of Catalonia is housed in the tall and proud Palau Nacional on the Montjuïc hill in Barcelona. 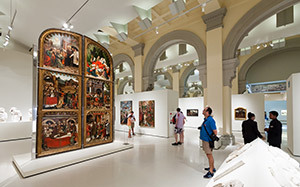 With a Million annual visitors and 290,000 artefacts, MNAC is one of the places to go to explore Catalan art from the 11th to the mid-20th century. Characteristically, the Museum is known for Catalan art and design from the late 19th and early 20th centuries, including modernism and its bizarre Catalan-flavoured opposite ‘noucentism‘. Just as importantly, the museum exhibits an outstanding collection of romanesque church paintings unmatched by any other museum in the world. MNAC’s modern art collection owes much to the 1888 Universal Exhibition, when Barcelona City Council installed a fairly modest but sound collection of contemporary art. 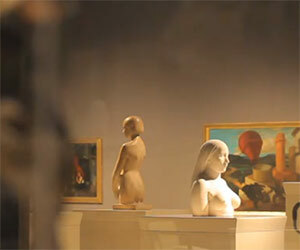 Since then the collection has grown stronger with acquisitions of modern art up until WW2. 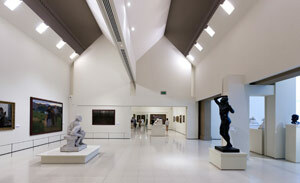 The collection has been curated into sections displaying works of Neoclassical, Romantic, Abstract and Realist movements. On balance the museum offers you mostly art of Catalan, cultural, significance, there is naturally art from the Balearic Islands which used to be part of Catalonia (Mural paintings of the Conquest of Majorca). 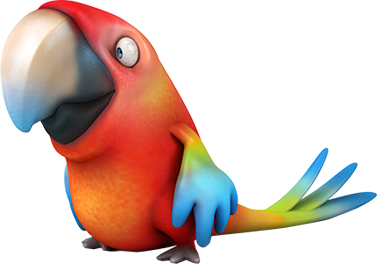 Add to that, plenty of art from the rest of Spain e.g. Francisco de Goya and Diego Velázquez and the former Spanish territories such as Flanders in the present-day Netherlands and Belgium. Finally, there are also some Italian and French influences thrown in for good measure as there is in many other decent museum collections. The Italians are Sebastiano dal Piombo, Tiziano Vecellio (Titian), Fra Angelico, Pietro da Rimini, Taddeo Gaddi and Giandomenico Tiepolo. The Flemish are Peter Paul Rubens and Lucas Cranach and the French imports are Jean-Honoré Fragonard and Maurice Quentin de la Tour. The huge Italian-style palace looks as if it is older than it really is and was dedicated exclusively to art all along. However the building was completed in 1929, but it was not until 1934 it was used for the purpose of showcasing Catalan visual art from the three aforementioned three collections. 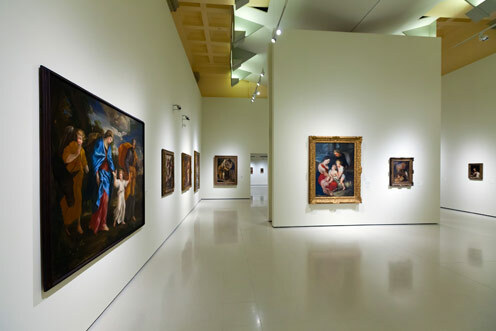 The 1934 project to install these Catalan art collections together in the Palau Nacional, was led by Joaquim Folch i Torres, the first director of Catalonia Museum of Art. The Spanish Civil War broke out in 1936, it resulted in a fire and subsequently parts of the collections were placed under the aegis of other museums either locally or as far afield as Paris. Sadly, the Palace then fell into dereliction. However, after the fall of the dictatorial Franco regime in 1975, the local Catalan government felt compelled to restore the space for modern public use. Hence the Palace was declared a national museum in 1990. The large Oval Hall was reopened in 1992 on the occasion of the Olympic Games, and the various collections were installed and opened from 1995 and onwards. 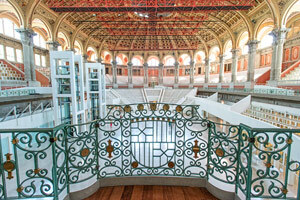 Finally, the fully refurbished Museu Nacional d’Art de Catalunya (Museu Nacional) was inaugurated on 16 December 2004.